The B90 is the classic foosball table that comes to mind when you think of a Bonzini foosball table. This is their flagship home table model that players purchase for their own personal use. 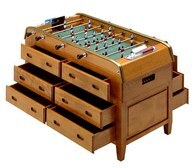 Bonzini tables are known for their European style of foosball play that allows for ultimate ball control and finesse. 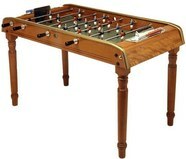 European style play uses many foosball pin shots instead of the raw power and speed of the American style tables like the Tornado. 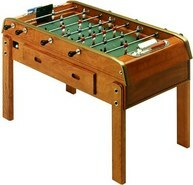 The materials that the Bonzini B90 foosball table is made with are the same as you find on the bar B60 version. The large table cabinet are laminated with high quality Beech wood, with a 22mm thickness. The assembly is reinforced by mechanical elements that give it a great resistance. Hand polished aluminum components and perfectly machined mechanical foosball parts set the Bonzini table apart. And it’s the heavy aluminum player and cork foosball ball combo that gives you that renowned ultimate ball control. 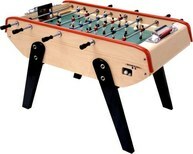 Pin shots, rebounds and trick shots will be at the heart of your foosball shots portfolio with a Bonzini foosball table. 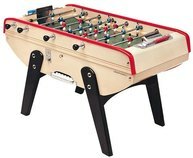 Since this table has all of the best features we look for when reviewing a table, the Bonzini B90 was awarded our best European foosball table.